Fifteen years after he disappeared from the page, maverick policeman Tito Ihaka’s critically acclaimed return from exile in Death on Demand has now won Paul Thomas the prestigious Ngaio Marsh Award for Best Crime Novel for 2013. In Death on Demand, Ihaka’s career has been marooned in the Wairarapa, following a falling out with his Auckland bosses. But a twist in the unsolved case that kick-started his troubles finds him back in the saddle, dancing around police politics and old grudges in the big smoke while on the trail of a shadowy hitman. 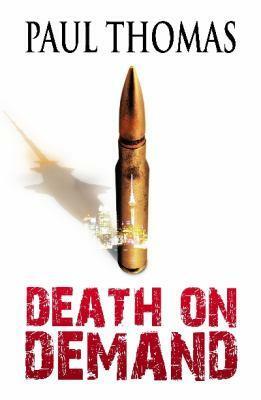 The judging panel, consisting of crime fiction experts from New Zealand and overseas, called Death on Demand “clever, beautifully written, and highly entertaining”. One international judge praised Thomas’s “strong sense of place” in the “densely plotted and humorous tale”, while another said she “learned a lot about New Zealand: class, race, and more... this was a real classic mystery ... I can’t wait to read the rest of the series”. Ihaka was described by the judges as “a unique character in the cop world”, a man whose “determination to do things his way is appealing, and so is his readiness to say exactly what he thinks, even when the result is crashing rudeness”. The Ngaio Marsh Award for Best Crime Novel, established in 2010, is named for Dame Ngaio Marsh, who is renowned worldwide as one of the four Queens of Crime of the Golden Age of Detective Fiction. Dame Ngaio published 32 novels featuring Inspector Roderick Alleyn between 1934 and her death in 1982. With sales in the millions, and her books still in print to this day, Dame Ngaio is one of New Zealand’s most successful authors in history. Dame Ngaio’s closest living relative, John Dacres-Manning, gave his blessing for the New Zealand crime writing award to be named in her honour, saying that “I know that Dame Ngaio would be so proud... to know that her name is associated with the award”. In addition to the award itself, Thomas wins a set of Dame Ngaio’s novels, courtesy of HarperCollins, and a cheque for $1,000 from the Christchurch Writers Festival Trust.